Charles Dickens would have been 200 years old today, as he was born on the 7 February 1812. His connections with various parts of Southwark are well documented, but some of his activities in South East London in the later years of his life were rather secretive. A number of biographies mention that during the 1860s he had rooms in New Cross which he used for writing and who knows what else. Jack Lindsay writes in 'Charles Dickens: a biographical and critical study' (1970): 'His habit of wandering round in strange places at strange times of the day or night went on; and he had a secret retreat in an apartment close to the “Five Bells” at the corner of Hatcham Park Road'. Ian Cunningham's 'A reader's guide to writers' London' (2001) states that he had a 'set of lodgings, opposite the Five Bells pub on the corner of New Cross Road and Hatcham Park Road, for some years as a place where he could work in peace'. The exact address isn't stated, but if it was directly opposite the Five Bells pub it would be this building at 157 New Cross Road, currently housing Winkworth estate agents. This would have been in the period when he was working on 'Our Mutual Friend' (1865), in which an area that is clearly New Cross is described as 'the flat country tending to the Thames, where Kent and Surrey meet, and where the railways still bestride the market gardens that will soon die under them'. In an 1868 letter, Dickens mentions that he will 'come to Gad's by some train from New Cross' (Gad's Hill Place was his home at Higham, near Rochester in Kent). 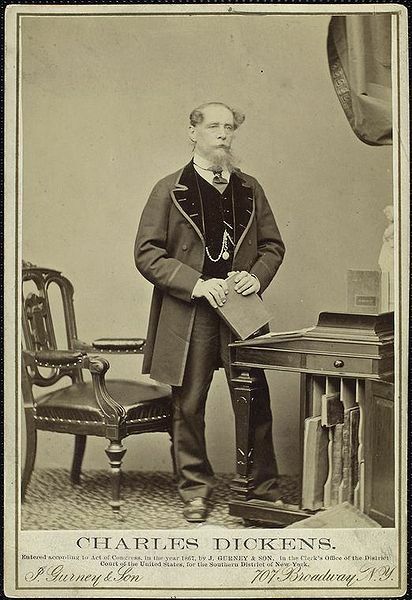 Dickens famously had a long term affair with the actress Ellen Ternan, the cause of his separation from his wife in 1858. In July 1868, Dickens rented a house for her, Windsor Lodge, in Linden Grove, Nunhead, where he was a frequent vistor. Indeed it has sometimes been conjectured that Dickens actually died there in 1870, but that his body was moved to Gad's Hill to avoid a scandal. The source of this story was evidently the caretaker at Linden Grove Congregational Church, opposite Windsor Lodge, but it is not generally accepted by biographers. It is discussed in detail in 'The Invisible Woman: The Story of Nelly Ternan and Charles Dickens' by Claire Tomalin who leaves open the possibility that he may have been taken ill in Nunhead and then returned to Gad's Hill to die. The house no longers stands, but was at 31 Linden Grove. Old maps show that the church was next door to where the dental surgery now stands at 42 Linden Grove, so Windsor Lodge was presumably more or less opposite that. Various Dickens activities going on, including tonight 'Happy Birthday Mr Dickens', an evening of readings and musical interludes performed by Jonathan Kaufman's company, Spontaneous Productions at St Bartholomew's Church in Sydenham. Tickets available in advance, £10 (£5 under-16s) from Kirkdale Bookshop or on the door. Also various things at Southwark Cathedral, including a talk tonight by Dickens biographer Claire Tomalin. P.S. My blog is now on wordpress. Great research as ever, thank you! Great post on Dickens local links to area.. one of CD good friends whose ghost haunts the Haymarket Theatre was the playwright & actor .. JB Buckstone .. whose grave lies in Brockley & Ladywell Cemetery.. I used to live a couple of doors away from there (as did the actor Gary Oldman). Of course if it was directly opposite the Five bells it could be one of the properties at the end of Besson Street. "down in that district of the flat country tending to the Thames where Kent and Surrey meet, and where the railways still bestride the market-gardens that will soon die under them. ... a neighbourhood which looked like a toy neighbourhood taken in blocks out of a box by a child of particularly incoherent mind, and set up anyhow; here, one side of a new street; there, a large solitary public-house facing nowhere; here, another unfinished street already in ruins; there, a church; here, an immense new warehouse; there, a dilapidated old country villa; then a medley of black ditch, sparkling cucumber-frame, rank field, richly cultivated kitchen-garden, brick-viaduct, arch-spanned canal, and disorder of frowsiness and fog." There's also a short story "The Schoolboy's Story" where a pub, The Seven Bells, features - with a very expensive meal, £20 a head! I wonder whether the 'dilapidated old country villa' was Hatcham House, demolished in 1869. Or it could have been Robert Browning's house at bottom of what is now Jerningham Road.